Arriving near sunset, my partner and I take our seats facing the 1,500-foot red rock cliffs at Southern Utah’s Tuacahn Amphitheater, the rocks glowing in the magic hour light. We’ve just driven in from Salt Lake City, but the bustling energy of the city quickly fades, and we find ourselves enchanted as a tale as old as time unfolds on stage. The classic story of Beauty and the Beast comes to life as actors dressed as candlesticks and clocks sing and dance to “Be Our Guest,” their voices echoing against the canyon walls. One of three Broadway-caliber live shows that Tuacahn hosts each year, the dramatic desert setting breathes new magic into this old fairytale. The Little Mermaid, When You Wish and The Sound of Music will soon grace this stage, and no performance disappoints in this spectacular space. From the freeway, it’s easy to mistake this hamlet for a strip mall-filled border town, but visitors discover that St. George, Utah, boasts a flourishing art and culture scene that beckons exploration. From theater to galleries to a thriving music scene, this red rock utopia is more alive than ever. And the secret is out. St. George’s booming population has made it the fastest-growing metro area in the nation, with retirees and young adventurers alike relocating to this desert paradise that’s a short drive from Zion National Park, vast red rock wilderness and conservation areas and a cluster of Utah’s best state parks. But you don’t have to move here to get in on the action. St. George’s spectacular landscapes, small town charm, and big city amenities make it an incredible place for an artistic escape. Built in the shadow of tall red rock sandstone cliffs, Tuacahn puts on Broadway productions in a dramatic outdoor amphitheater near Snow Canyon State Park. The word “Tuacahn” means “Canyon of the Gods,” and its stunning rugged backdrop enhances any production. Catch musical performances by leading local and national acts on the outdoor stage through November, long after northern Utah’s temperatures have gone cold. Return to Tuacahn on Saturday mornings for a weekly market featuring local art, crafts, food, and free live entertainment. An ever-changing set of painters and artisans sell their wares alongside Tuacahn Canyon, and musical acts play until afternoon. To discover the essence of St. George’s authentic art scene, make a beeline for the artist enclave of Kayenta. Creative types have long touted the inspirational benefits of living amidst these soaring cliffs and dazzling panoramas, illustrated by Kayenta’s popularity. Built against stunning varicolored rock walls just seven miles from St. George, Kayenta bustles with galleries, studios, festivals, retail shops, gourmet food, a yoga studio and even a spa — just in case you need a vacation from your vacation. Venture into Juniper Sky Gallery to see wind sculptures and Mystic Canyon Light for outdoor landscape photography. Find impressive ceramic works at Zia Pottery Studio. Refuel and caffeinate amidst a xeriscaped desert (one that needs very little irrigation) at Xetava Gardens Café, a Kayenta coffee shop and kitchen surrounded by lava fields. 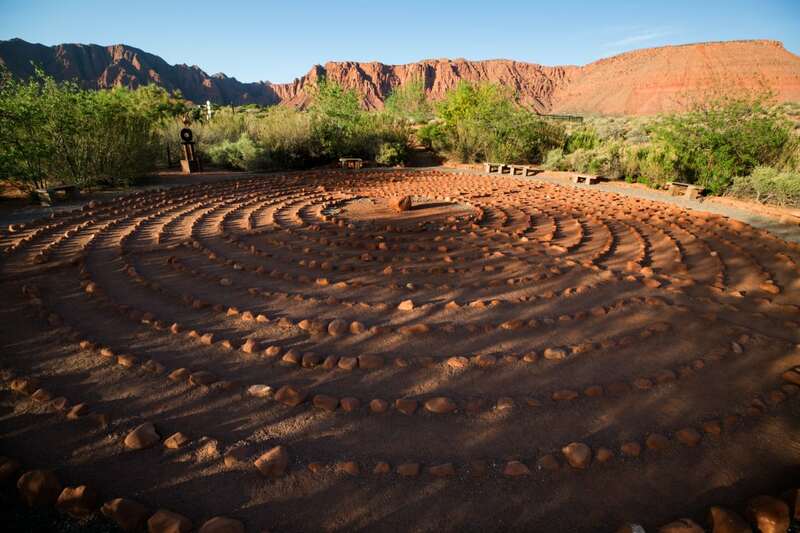 Then catch a brilliant sunset in the sculpture garden or stroll around the meditative Desert Rose Labyrinth built by Kayenta locals. Catch performances by musicians, comedians, artists and actors at the new, multifunctional Center for the Arts in Kayenta Art Village. Completed in 2017, the spacious center encompasses 11,000 square feet along with an outdoor plaza. Stay for one of the region’s signature art festivals and gallery walks. High temperatures mean summers are slower here, making the art-strolling season a reason to visit during the cooler months of March (St. George Art Festival), April (Street Painting Festival) and October (Art in Kayenta Festival). St. George is home to 16 museums and galleries, and one of its best served as a simple sugar-beet-seed storage facility before being transformed into an art museum. Through the work of the community, St. George Art Museum opened in 1997 in this restored space. Today, the museum boasts a collection of regional and local art exhibits as well as rotating collections and events like date nights and book clubs. For relaxation amidst classic and contemporary art, visit Dixie State University’s Sears Art Museum. The museum features six exhibits each year and an outdoor sculpture garden where you can meditate and meander among reflecting pools and bronze sculptures. Admission to both is always free. Casual and free is the name of the game at this outdoor Monday music series. Make it a long weekend and pack a picnic for these family-friendly Concerts in the Park that run from April to September in Vernon Worthen Park. Pick up some picnic fixings and then lounge on a blanket and soak up jazz, rock and roll and R&B under the stars. Performing arts are popular in this community, and there’s room for more than one theater in town. Beyond the red rocks of Tuacahn, find Brigham’s Playhouse, a family-friendly theater focusing on fun, affordable performances. Its location inside a saloon-styled structure in Washington, just outside St. George, adds to the ambiance, and you can enjoy an old-fashioned root beer or dessert during any performance. Popular St. George Musical Theatre closed for nearly five years when it lost access to its performance venue, but the company’s return to the old St. George Opera House has been met with enthusiasm. See classics like Annie, The Music Man and Guys and Dolls performed here by talented singing and dancing casts. Hear the sounds of Handel’s Messiah and masters like Beethoven and Brahms at performances by the Southwest Symphony Orchestra. This 75-member orchestra calls the Cox Performing Arts Center on the campus of Dixie State University home and is celebrating 36 years of inspiring the community with classic symphonic performances. Whether you come to St. George for the professional theater, dazzling landscapes, or abundant art galleries, this booming southern Utah destination just four hours from Salt Lake City makes the perfect place for a cultural getaway.